There is growing recognition that composition and metabolic activity of the gut microbiota can be modulated by the dietary proteins which in turn impact health. The amino acid composition and digestibility of proteins, which are influenced by its source and amount of intake, play a pivotal role in determining the microbiota. Reciprocally, it appears that the gut microbiota is also able to affect protein metabolism which gives rise to the view that function between the microbiota and protein can proceed in both directions. In response to the alterations in dietary protein components, there are significant changes in the microbial metabolites including short chain fatty acids (SCFAs), ammonia, amines, gases such as hydrogen, sulfide and methane which are cytotoxins, genotoxins and carcinogens associated with development of colon cancer and inflammatory bowel diseases. A suitable ratio between protein and carbohydrate or even a low protein diet is recommended based on the evidence that excessive protein intake adversely affects health. Supplying high and undigested proteins will encourage pathogens and protein-fermenting bacteria to increase the risk of diseases. These changes of microbiota can affect the gut barrier and the immune system by regulating gene expression in relevant signaling pathways and by regulating the secretion of metabolites. 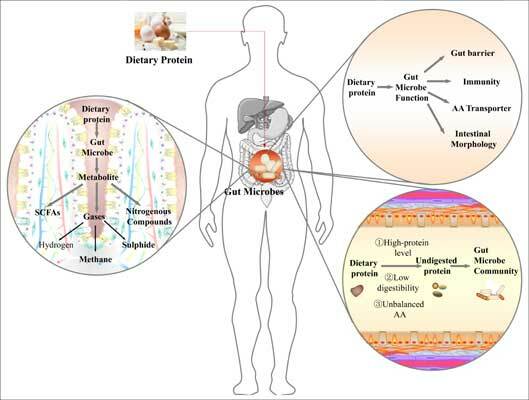 The objective of this review is to assess the impact of dietary proteins on microbiota composition and activity in the gastrointestinal tract. Attention should be given to the dietary strategies with judicious selection of source and supplementation of dietary protein to benefit gut health. Keywords: Dietary protein, intestinal microbiota, metabolites, gut barrier, amino acid balance, digestibility. Keywords:Dietary protein, intestinal microbiota, metabolites, gut barrier, amino acid balance, digestibility. Abstract:There is growing recognition that composition and metabolic activity of the gut microbiota can be modulated by the dietary proteins which in turn impact health. The amino acid composition and digestibility of proteins, which are influenced by its source and amount of intake, play a pivotal role in determining the microbiota. Reciprocally, it appears that the gut microbiota is also able to affect protein metabolism which gives rise to the view that function between the microbiota and protein can proceed in both directions. In response to the alterations in dietary protein components, there are significant changes in the microbial metabolites including short chain fatty acids (SCFAs), ammonia, amines, gases such as hydrogen, sulfide and methane which are cytotoxins, genotoxins and carcinogens associated with development of colon cancer and inflammatory bowel diseases. A suitable ratio between protein and carbohydrate or even a low protein diet is recommended based on the evidence that excessive protein intake adversely affects health. Supplying high and undigested proteins will encourage pathogens and protein-fermenting bacteria to increase the risk of diseases. These changes of microbiota can affect the gut barrier and the immune system by regulating gene expression in relevant signaling pathways and by regulating the secretion of metabolites. The objective of this review is to assess the impact of dietary proteins on microbiota composition and activity in the gastrointestinal tract. Attention should be given to the dietary strategies with judicious selection of source and supplementation of dietary protein to benefit gut health.